Zach Galligan in The Chair. Photo courtesy of Alterna Comics. This week's featured guest is actor and Seahawks fan Zach Galligan. He is well known for his role as Billy in Gremlins (1984) and Gremlins 2 (1990) and has more than 60 film and television credits including Tales from the Crypt, Star Trek: Voyager, Law & Order: Criminal Intent, and many films in the triller, sci-fi, and horror genre. Zach talks about some of his favorite movies from the 80s, we talk about the Seahawks 2015 schedule and he offers his opinion on how he thinks the Seahawks will do this season. We also take a look back at how Zach broke into the acting profession and look ahead to a possible new Gremlins movie on the horizon. We get some insight into one of his latest movies, The Chair, and why he prefers to play a bad guy. Check out the teaser trailer for The Chair via YouTube and follow @theCHAIRhorror on Twitter for any updates on the film's release. 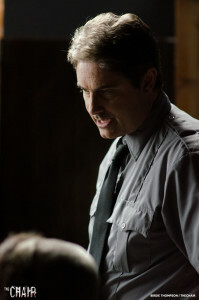 Follow Zach on Twitter @zwgman and on Instagram.